Effortlessly sculpt and define the planes of your face with Sculpt Four, an airy fan brush from Sonia G. Designed for creating soft, natural shadows with contour powder and bronzer, Sculpt Four is an easy, everyday sculpting brush that lays down even layers of product and polishes them to a seamless finish. 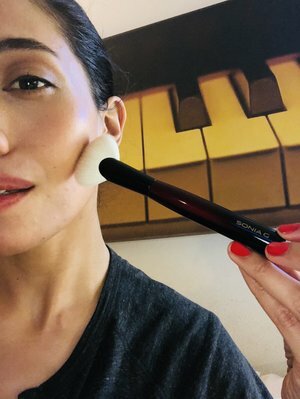 “Sculpt Four offers a slightly softer application of contour and highlighter than Sculpt Two, and it also can be used to blend blush or set makeup with powder.” — Sonia G.
To highlight, pick up product with the side of the brush and apply with a soft patting or swiping motion. To contour, sweep the tip of the brush from the temples to the cheekbone, starting with the shorter side. GReat hard-pressed highlighter and blush brush! I ordered this brush basically blind because there were no reviews and it isn’t part of the set but I’m really glad I did. The Sculpt 3 brush works great with my softer highlighters such as Hourglass, but this brush works better with my hard-pressed highlighters such as Sephora Golden Hour, which I previously had trouble getting it to show up on my face. It is denser than Sculpt 3 but still soft and flexible, and I am able to get precise placement of product. I have also used it as a blush brush and the shape allows for more precise placement as well. Very happy with my purchase. This brush is just as good as all the other Sonia G brushes (I have collected almost every single one). 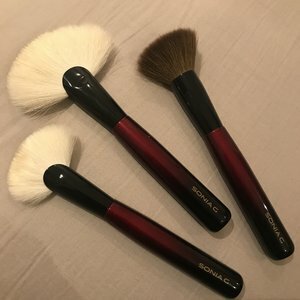 I feel like the Sonia G brushes are different from all other brushes I have ever tried - somehow they are more functional for me and makes my makeup routine so much easier. Her design just "catches" my preferences I guess. 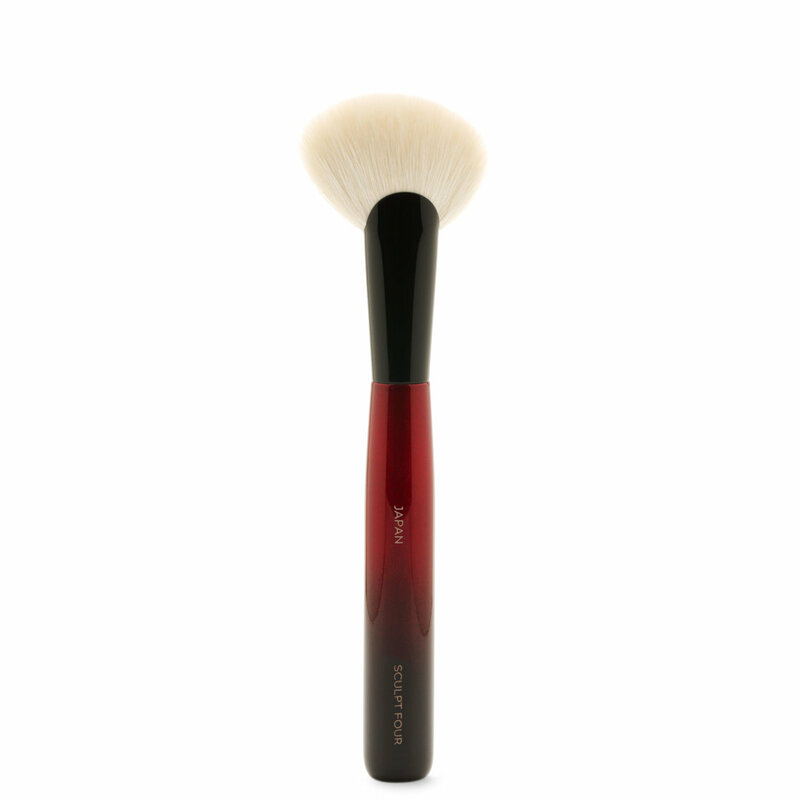 But back to this brush: it blends contour like a dream with its angled brush head. I have a little mini review on my instagram if you want to check it out: nessa3112. I am very familiar with japanese brushes ad these are the only brushes i use. Sonia G’s brushes are at par...if not, better than some of my hakuhodo, chikuhodo, and koyudo brushes. Its super soft and delivers as described. Im now eyeing to buy the rest of her brushes to add to my collection!! I highly recommend Sonia’s brushes and you will NEVER regret purchasing them. It used to take me a long time to contour but not anymore. GREAT QUALITY. So happy I took the plunge and invested in Sonia G brushes. Am biased. SoniaG can do no wrong. But seriously?! Every beauty geek must own this. This is plush, precise and über soft for blending. You can own a few of this as it’s so multifunctional. I luv mine for contouring my cheekbones and my nose. Insanely delightful. And Beautylish? That’s another great story there!!! I really enjoyed using this brush! I used it with my nars dual intensity blush. My other brushes I used with this I would have to grind my brush to pick up product but not with the Sonia g brush. If you are considering buying this brush you should just do it. I can wait to get another one. I've ordered this lovely brush specifically for nose contouring and yes, I love it, this brush has replaced the two other brushes I've used so far for that step (pencil brush by Makeup Forever 216, fluffy MAC brush 224). I only want a soft nose contouring and it's perfect for that. For the sake of this review, I've used it with my former favorite, the in comparison rather "stiff" Kevin Aucoin Sculpting Powder and it has worked just lovely. (My actual go-to contouring powder these days is very finely milled / "soft" and by KKW Beauty but because not everyone likes her [products], I've tried the not so controversial KA powder, too.) To be completely honest: I'm not sure if this brush could give your nose a very sharp contouring (because of its size) if that is what you're looking for. You can also use this brush for your face contouring, soft or also accentuated/sharp – I've tried it, it has worked but I prefer my beloved Suqqu cheek brush for that because for me it is quicker giving me the soft "overall face shape" I want. I use sculpt four for bronzer and contouring it’s exactly what i wanted for a long time i never thought that i will see this kind of brushes! All her brushes work like magic! I have a really sensitive skin and her brushes are so gentle that you really feel the light bristles on your face When ever i buy one of her brushes it becomes my favorite! Sonia G i hope you keep coming up with more brushes.